Like each decade before it, the Fifties saw Hollywood and the independent studios make low budget Western after low budget Western. Trying to wade through them now is like trying to read a library of books that have no title pages: it’s difficult to tell if any one Western is better or worse than any other. But Stranger on Horseback (a title that’s not entirely accurate), is one low budget Western that deserves a closer look, and perhaps, over sixty years after it was made, a reassessment. Adapted from the story by Louis L’Amour, the Stranger in question is actually circuit judge Richard Thorne (McCrea). Arriving in a small town on a routine visit, he soon learns that there has been a murder recently, but that the man responsible hasn’t been arrested. When he asks why, he discovers that the town is owned and run by Josiah Bannerman (McIntire), and that the man who committed the killing is Bannerman’s son, Tom (McCarthy). Despite several warnings from the town sheriff, Nat Bell (Meyer), and Bannerman’s legal counsel, Colonel Buck Streeter (Carradine), that Josiah won’t allow it, Thorne voices his determination to ensure that Tom Bannerman is arrested and committed for trial. News of this development reaches Josiah, and he charges Tom with persuading Thorne to accept his hospitality. Tom’s presence in town leads, unsurprisingly, to his arrest, with Thorne being aided by Bell. With Streeter manoeuvring himself into place as the trial prosecutor, and less than veiled threats made by Josiah’s men as to the likelihood of a trial taking place, an uneasy stalemate exists while Tom languishes in jail. In the meantime, Thorne begins to piece together the events surrounding the murder, while also making an impact on Tom’s cousin, Amy Lee (Miroslava). Her attentions lead to Thorne meeting Josiah, and the last chance of a peaceful outcome in regard to Tom going to trial. Realising that there’s no chance of a trial – fair or otherwise – taking place in town, Thorne decides to spirit Tom away during the night and make for the nearest town, Cottonwood. But his ruse is quickly discovered, and Josiah and his men rush to head them off before Thorne and Bell can get Tom, along with two witnesses to the shooting, to the safety of the nearby town. For a low budget Western that runs a somewhat paltry sixty-six minutes, Stranger on Horseback is definitely deserving of a much better level of recognition amongst modern day audiences. Directed by the hugely talented Tourneur, this was one of a number of Westerns he made in the Forties and Fifties, and his second with McCrea as the lead. One of Tourneur’s strengths as a director was his ability to draw out strong performances from his casts, and then ally them to a palpable sense of mood. In doing so he made his movies stand out by virtue of their credibility and an often surprising emotional depth. 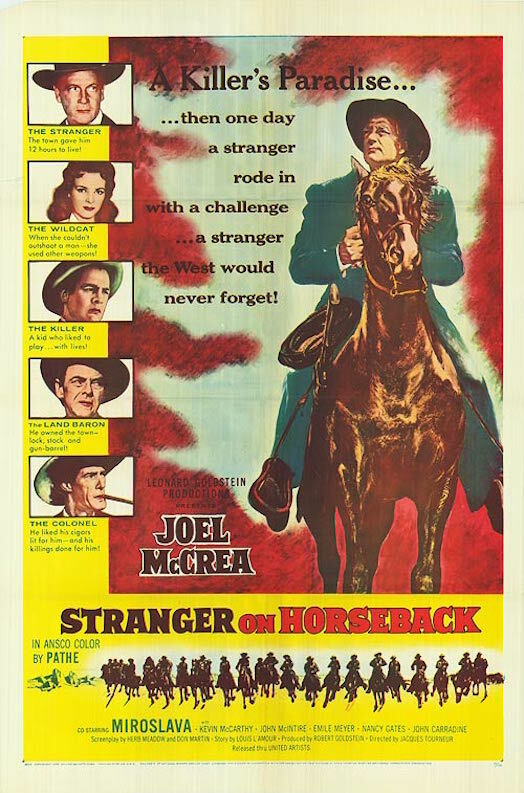 Stranger on Horseback is no exception, with McCrea perfectly cast as the tough, no-nonsense judge whose reputation means he doesn’t have to carry a gun unless absolutely necessary. 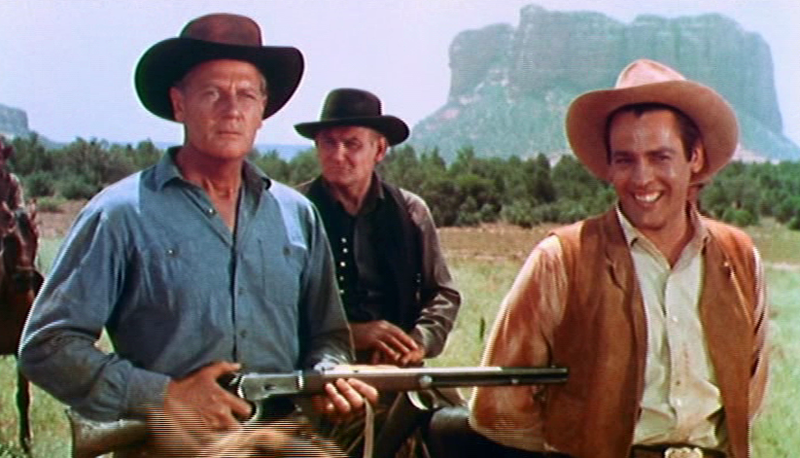 McCrea made a lot of Westerns in the Fifties, but this is easily one of his best, his performance far more subtle and measured than the material might seem to deserve. In tandem with Tourneur’s assured direction, McCrea makes Thorne the kind of hero whose integrity and law-abiding nature is never in question. As the proud land baron Josiah Bannerman, McIntire is a terrific adversary for McCrea, his egoism a perfect counterpoint for Thorne’s rectitude. McIntire was a great character actor, often quietly giving memorable performances in the background of bigger movies, and although his presence here requires a degree of repetition in terms of relaying the same threats over and over, he nevertheless imbues Josiah with a sincerity of intent and action that overcomes an awkward last-minute reversal of purpose. 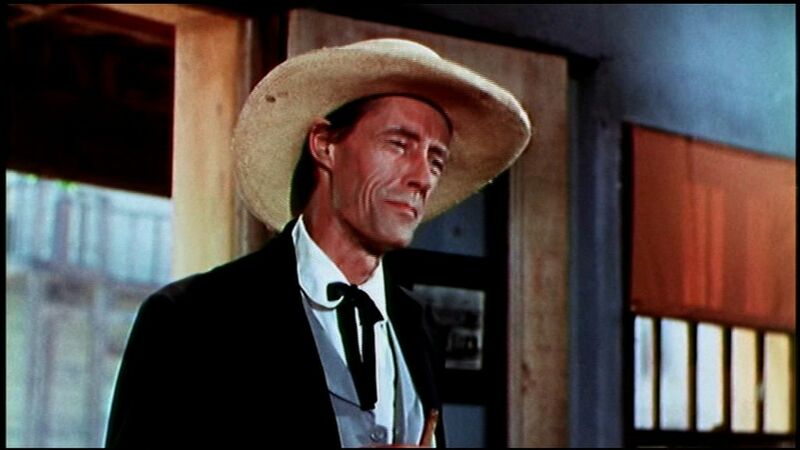 And then there’s the wonderful John Carradine, cadaverously charming as ever as the smooth-tongued, lizard-like Colonel Streeter. His scenes with McCrea are a testament to his talent as an actor, his delivery and equanimity in the part a perfect example of what can be done with a supporting role if you have the skill and the encouragement of your director. It’s also a performance that foreshadows his role as Major Cassius Starbuckle in The Man Who Shot Liberty Valance (1962); both portrayals are hugely enjoyable, and both highlight just how good Carradine was when given a halfway decent script to work from. Further down the cast list, McCarthy is appropriately callow as Tom Bannerman, while there’s a beautifully judged performance from Meyer as the sheriff who finds newfound courage thanks to Thorne’s arrival (Meyer is one of those actors whose face is so familiar, you’d swear you’ve seen him in more movies than he’s actually appeared in). Tourneur brings out the best in everyone, and in doing so, elevates the very basic plot and storylines in Herb Meadow and Dan Martin’s screenplay, making it a richer and more rewarding experience than anyone could have predicted. While the movie is a great, unsung example of low budget Western movie making, unfortunately there is one issue it can’t presently overcome. 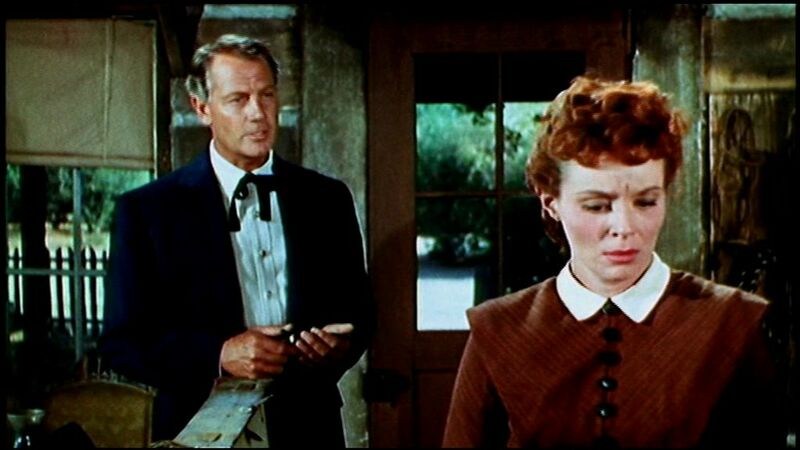 Existing copies of the movie have become so degraded that the gorgeous Arizona locations – filmed in Ansco-color – are now a riot of over-exposed colours and blurred details. It’s so bad that when we first see McCrea riding into town it looks as if he doesn’t have a face. This is a movie in desperate need of restoration. Let’s hope a pristine copy surfaces at some point, and the movie can be seen as it was meant to be. Rating: 8/10 – a superior Western thanks to the involvement of Tourneur, Stranger on Horseback is a richly rewarding movie with some outstanding performances to further add to its stature; with only a rushed conclusion to keep it from being a complete and utter classic, this is still a prime example of a low budget Western that shouldn’t be dismissed or ignored purely because of its provenance.